Today is a special day for some men out there in the world and to a lot of those single mom’s out there too, such as myself. Father’s Day is one of those holidays rarely celebrated in my house. I’ve been a single mom since the day I found out I was pregnant with my daughter…that was 4 years ago. Her father hasn’t been in her life at all, so it makes it one of those holidays that we don’t pay much attention to. Though I do send out the typical hallmark card or phone call to both of my dad’s, wishing them all the best on this holiday. The real person I really wish to spend it with just doesn’t happen to be here anymore, my grandpa. He was the greatest father a child and grandchild could ever wish for. He was a great mentor and teacher. He also had a lot of love to give and a lot of patience, even after I licked his stamp collection to the floor. Hey, I was two and it was my primary job, to lick stamps each time he took me to the post office. So, I thought I was helping out. 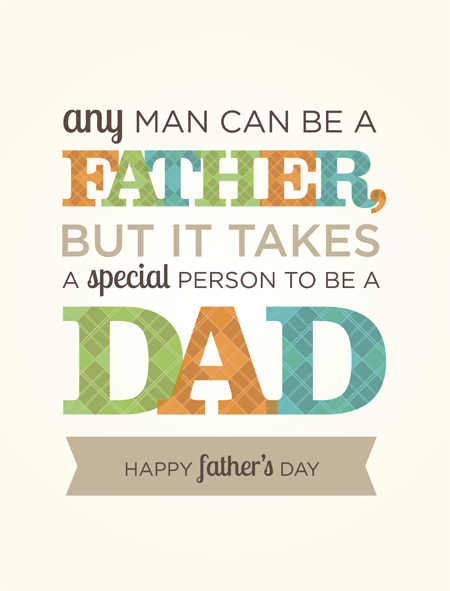 Happy Father’s Day to all of you Daddy’s and single Mommy’s out there! This entry was posted in Blog and tagged children, dad's, daddy's, father's, father's day, grandfather's, kids, parenting, single mom, single moms on June 16, 2013 by JenniferNAdams.